Over the past week or so, UK headlines have been dominated by reports that both sides are inching closer to a deal. But so far there have been mixed messages on exactly what could be agreed, and when it might happen. To get a better handle of what's going on, let's break it down into the two things that need to be resolved between the UK and EU. Firstly, there's the so-called Irish backstop, where discussions are beginning to get very technical. We dived into this in more detail last week, but ITV's Robert Peston reports that the EU could be prepared to accept British demands for an all-UK customs union to be built into the Irish backstop solution. In exchange, the UK would need to accept that regulatory checks could arise between Northern Ireland and the British mainland if they leave the single market in future. Some reports indicate this could be settled in time for the EU Council meeting next week, but as ever the challenge is 'wording' it in such a way that will convince MPs to vote in favour of the agreement. That's where the second part of the agreement comes in - the political declaration on future trade - and this is where there seems to be more disagreement on the way forward. The idea is that this declaration will set out a vision for what the future trading relationship might look like. 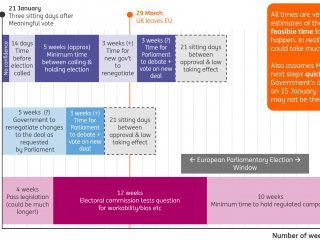 Bear in mind; this is simply a political statement of intent – the nitty gritty details will be negotiated during the transition period after March 2019. And being a political statement, none of it will be legally binding. In other words, it’s going to be vague - but deciding exactly how vague seems to be proving a bit of a dilemma. Plan A - at least from the EU's perspective - is to make this as vague as possible, with reports suggesting a draft version originally due for release this week could contain as few as four pages and will be little more than a series of "annotated headlines". The recent optimistic tone struck by the EU - including in the run-up to the recent Salzburg summit gives us a flavour of the sort of language the document is likely to contain. It's likely to be heavy on words like 'ambitious' and 'unprecedented', but short on details on exactly what this means in practice. Reports also indicate the EU is open to an 'evolution clause' that would leave Brussels open to an improved offer if the UK changes its mind on what it wants. The hope is that all of this will be enough to convince MPs from across the Brexit divide that whatever the declaration ends up saying is not set in stone, and that their own aspirations for the future agreement are still alive. However, the UK government appears concerned that this vague approach will not be enough to win over lawmakers from the Northern Irish Democratic Unionist Party (DUP). DUP leaders are concerned about reports that the government now accepts the backstop would lead to regulatory barriers between Northern Ireland and the British mainland, and the party is reportedly considering voting against the forthcoming budget if the Prime Minister doesn't change course. With that in mind, a government spokesman said on Monday that the UK is looking for more "precise" wording on future trade in the declaration, presumably in a bid to reassure DUP MPs that the Irish backstop will never be needed. But there are two issues with making the declaration more detailed. Firstly, the UK's Chequers proposal for post-Brexit trade is disliked by the EU, so Brussels will be very reluctant to make the document more specific in the way the British government would like. Secondly, because there is no majority in Parliament for any kind of Brexit trade model, adding extra detail might please some MPs, but risks alienating many others with different views on how the future relationship should look. In short, the choice of words employed in the political declaration will be an extreme balancing act - and the fact that Brussels has delayed the publication of a draft, originally due earlier this week, highlights how difficult this part of the deal is proving to be. Nonetheless, we still expect the UK and EU to reach an agreement, be it at next week's meeting or more likely, at a summit in November. But of course, we won't know for sure that 'no deal' has been avoided until MPs have had their say, which is unlikely to happen until mid-December at the very earliest.